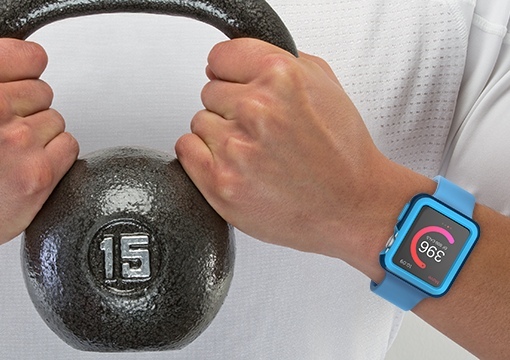 So, you’ve just bought an Apple Watch. Congratulations – the trendy new device is quite handy. It lets you answer calls and email, control music, view calendar appointments and navigate your way around the city through the use of apps. It even tells time! Just like your iPhone, the $349 Apple Watch is a sensitive, easily-damaged piece of technology that’s worth protecting. Thankfully, there are a number of third-party cases and screen protectors designed to do just that. Here are some attractive Apple Watch accessories that we think are worth your consideration. Speck, the company behind the popular CandyShell iPhone fashion cases, has just released similarly colorful protection for your Apple Watch. The CandyShell Fit has a rugged polycarbonate exterior to protect against dings and scrapes; its thermoplastic polyurethane (TPU) interior protects against shock. A 1.5 mm raised bezel, meanwhile, acts as a bumper to protect your screen. The Speck CandyShell Fit will be available in a wide range of colors when it comes out later this month. It carries a MSRP of $29.95. You can sign up to receive updates about the product’s availability at the Speck website. If the CandyShell’s activity-tracker-inspired design doesn’t feel appropriate for your lifestyle, Spigen’s slate of protectors may be a better fit. The Apple Watch Case Tough Armor has a decidedly rugged look that makes your Apple Watch look a bit more like a standard watch; it’s made of TPU and features a metalized button. 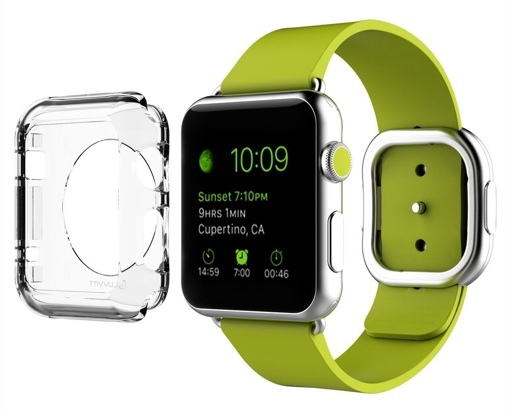 For a more minimalist look, check out Spigen’s Apple Watch Case Liquid Crystal. It’s a clear 0.8 mm thick clear TPU case designed to look like you’re not wearing a protector at all. Spigen’s Apple Watch Case Tough Armor [42 mm] can be purchased on the company’s website for $24.99 or from Amazon for $16.99. The Apple Watch Case Liquid Crystal [38 mm] will be available later this week for $14.99 ($9.99 on Amazon). You can view the full range of Spigen Apple Watch accessories in at the Spigen website. The above-mentioned Apple Watch cases have attractive designs, but they fall short in one key area: None of them come standard with a screen protector. Not so with the LUVVITT CRISTAL case – it’s a clear polycarbonate casing with a tempered glass screen protector that eliminates the threat of scratches. It's a nice, non-obtrusive protective solution that offers full-body protection while still showing off the design of your Apple Watch. You can find the LUVVITT CRISTAL case in both 38 mm and 42 mm sizes on Amazon.com for $14.99. 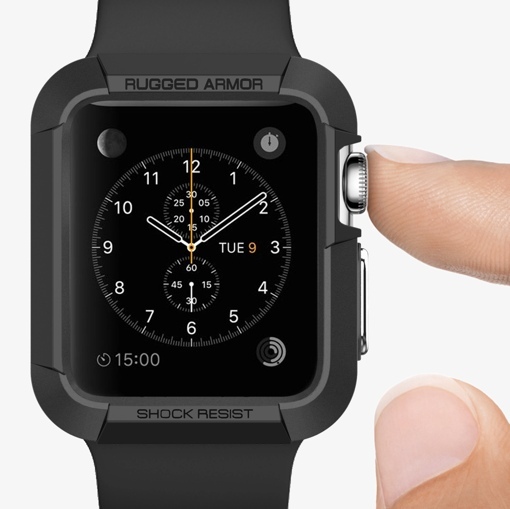 Let’s be honest: Full-body Apple Watch protectors aren’t for everyone. In many cases, simple screen protection may be enough – like that provided by IQ Shield. The company offers simple adhesive TPU films that protect from simple scratches while looking completely invisible to the naked eye. You can choose to just protect the screen for $9.95 (both 38 mm and 42 mm sizes), or get both front and rear scratch protection for $15.95 ($9.95 on Amazon). All are now available for purchase on the IQ Shield website. Want even more screen protection? 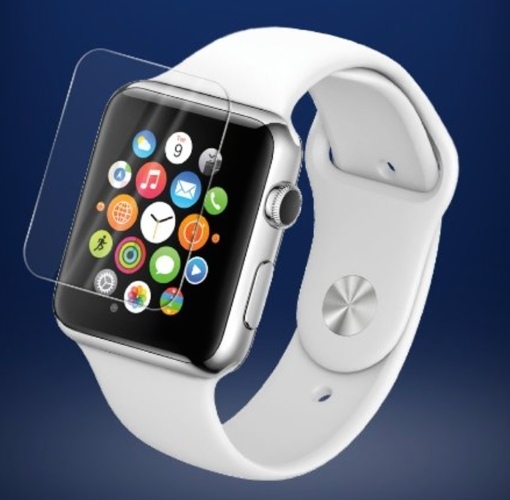 Take a look at the Skinomi Tech Glass protector. It’s an ultrathin (0.33 mm) sheet of specialized tempered glass that offers a powerful layer of shatterproof scratch-resistance (five times better protection than polyethylene films) while maintaining 99.9% clear transparency. Best of all, it doesn’t break the bank – you can find your Skinomi Tech Glass protector on Amazon.com for $7.95.